This week, we have gorgeous Watermelon Radishes in the store. Read on to learn all about them! As Spring begins its awakening once again, we all start to gravitate to fresher, more colorful foods as the weather starts to clear and warm up, and we turn off the heat and open our windows for the first time in months for some much needed fresh air. Watermelon radishes are just what we need: bright, fresh, colorful, and versatile. Watermelon Radishes are part of the mustard family and are related to arugula, turnips, and broccoli, and have a creamy, whitish exterior, with a bright pink, almost watermelon color when cut open, hence their name. 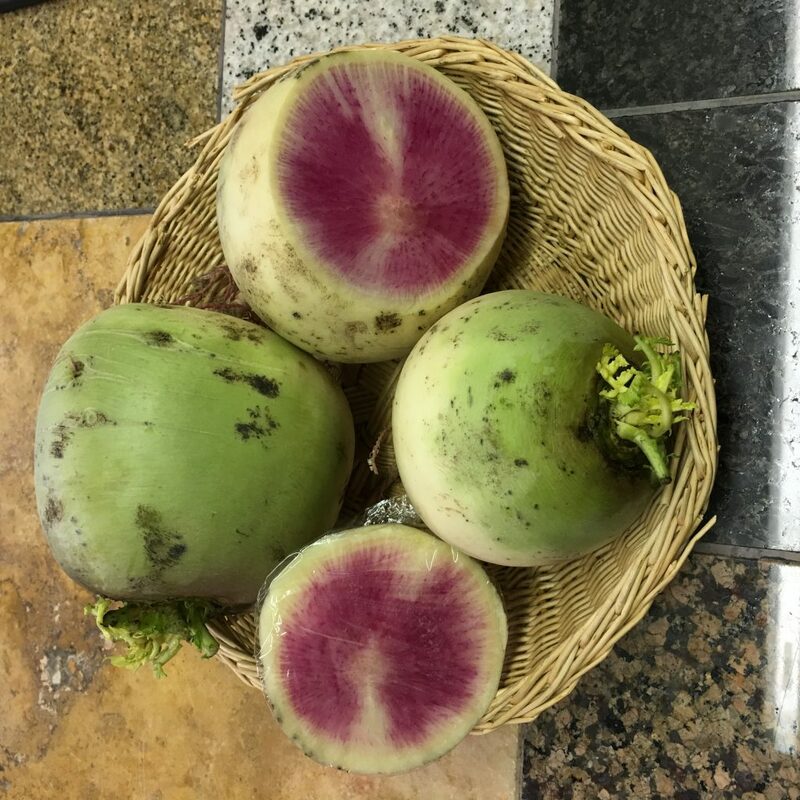 These radishes are an heirloom variety of the Daikon radish that many are familiar with. They range in size from as small as a golf ball to as large as a softball, and have a mild flavor that more mild than a typical radish and is slightly peppery. It’s interesting to note that unlike other radish varieties, these particular radishes’ flavor will decrease in intensity as the radish gets older. The flavor is usually hottest closer to the exterior and gets sweeter toward the middle. 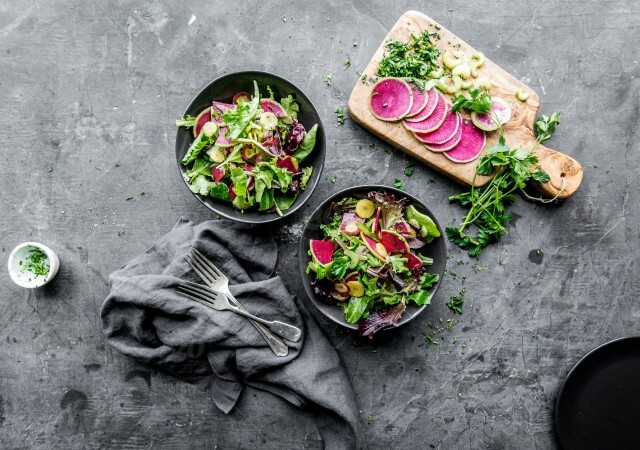 The greens and the radishes themselves both have a great deal of vitamin C when eaten raw, and like other radishes, they contain chemical compounds that make them a natural pest repellent, which is great for gardening and organic farming! They can be found year round, with peak season being in the late fall and in the spring. The spring radishes are harvested early in the growing season and as a result they are smaller, and in the winter months they are larger and sometimes more elongated in shape. They are very versatile, and do well in many applications such as pickling, roasting, braising, stir frying, mashing, or slicing raw for sandwiches and salads. They add a burst of beautiful color to any dish. Come on down tothe Coop and try some!